Freeport, N.Y., is seeking design and engineering services for a microgrid proposal that will compete in the $40 million NY Prize. The southern Long Island village, part of the town of Hempstead, wants to build a microgrid to help secure power supply should another disaster hit like Superstorm Sandy, which caused prolonged outages and extensive damage to the village’s electric grid. Freeport, which has a population of about 40,000 people, already operates its own distribution system along with two power plants that are interconnected with the Long Island Power Authority’s transmission system. Freeport plans to be among the municipal governments vying for up to $5 million in feasibility funds offered in the first phase of the NY Prize competition, which are due May 15 to the New York State Energy Research and Development Authority. Read more about the $40 million, three-phase NY Prize competition for microgrids. Because of the tight NY Prize deadline, Freeport seeks bids for engineering services no later than 4 p.m. ET, Tuesday, March 31, delivered to the Purchasing Department, 46 North Ocean Avenue, Freeport, New York, 11520. The village seeks microgrid proposals that address all phases of the project, but may award bid winners the opportunity to participate in individual phases or some combination. Freeport will evaluate bids based on a 100 point scale, with the heaviest weight going to three categories: bidder experience developing a microgrid, investment backing, and total project cost. Each of these categories can receive up to 20 points. Team experience on Long Island, including a local presence. Team skill in comprehensive development with personnel having experience in power engineering, commercial engineering, clean energy technology, transmission and distribution utility operations, working with regulators and project finance. Team includes an experienced developer with a proven track record developing infrastructure projects. A dedicated development platform focused on the implementation of microgrids within New York State. The request for proposals is available at here. 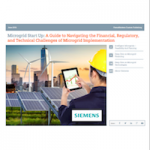 Track microgrid business opportunities by subscribing to the Microgrid Knowledge newsletter. It’s free.